Attention Trinity Trail users! There will be a small reroute on the trails today through Sunday for Ranch Bash. Trail access will remain continuous and there will be plenty of signs directing you where to go. Please let us know if you have any questions! The area indicated on the map is at the confluence of the 2 forks of the Trinity River near downtown. Here's a link to the area on Google Maps. 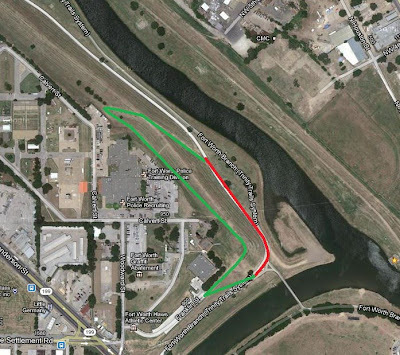 Basically, from the map, it looks like the trail will be routed up on the levee for the distance in green.